"Let's play with the animals, Mr. Chris!" he suggested. I have a large bin with plastic animals and dinosaurs. They serve multiple purposes. They can be sorted and categorized, they are good for fantasy play, and they are good for little hands as they are developing motor skills. Adam appreciates order and structure, so he immediately began sorting. "These are the animals that can be domesticated, these are the wild animals, and these are the dinosaurs." He got down to serious work, quickly calming and focusing while happily sorting through the animals just as I hoped he would. But then he got to the pigs. "NO WAY!! THAT IS NOT RIGHT!!!" he suddenly yelled out. "THAT IS TOTALLY NOT FAIR!!!" The calm that we had just achieved went flying out the window. "What's the matter?" I asked quickly. "You're doing fine." "NO I'M NOT!!" he screamed back. "THIS IS A PREHISTORIC ANIMAL!! IT CAN'T BE DOMESTICATED AND IT ISN'T THE SAME AS THESE WILD ANIMALS!!" 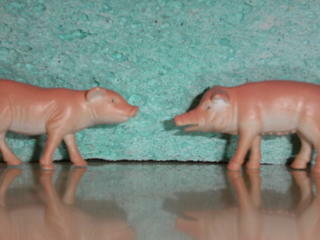 I looked to see what he was upset about, and he pushed a plastic pig into my face. "Adam," I began calmly. "It's just a pig." That was the wrong thing to say. "THAT IS NOT A PIG!!!! THIS IS A PIG!!!" he shouted as he thrust another animal under my nose. "PIGS HAVE SHORT SNOUTS. THIS PIG HAS A SHORT SNOUT BUT THIS ONE HAS A LONG SNOUT." I could see that I was already in deep trouble, so I didn't want to say too much. "Um, so?" "SO???? SO????!?!?" he repeated indignantly. "THIS SUPPOSED TO BE PIG IS NOT A PIG. IT IS A MOERITHERIUM. 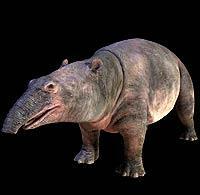 MOERITHERIUMS LIVED IN THE SECOND AGE OF MAMMALS, AND THEY ARE RELATED TO ELEPHANTS, NOT PIGS!!! AND THEY CAN"T BE DOMESTICATED, BECAUSE HUMANS DIDN'T DOMESTICATE ANIMALS BACK THEN. BUT IT ISN'T ONE OF THOSE WILD MODERN ANIMALS EITHER, SO THIS ISN'T FAIR!!!" I should know better than to argue, but he was the last child for the day and I obviously wasn't thinking clearly. "Adam, it's just a pig with a long snout." "WELL THAT JUST GOES TO SHOW HOW MUCH YOU KNOW. AND IF YOU THINK I AM GOING TO PUT A MOERITHERIUM IN WITH A DOMESTICATED PIG THEN YOU ARE NOT BEING FAIR AND I AM NOT COMING BACK HERE EVER AGAIN." Adam stormed out, grumbling on his way out the door, "EVIL THERAPIST!" I always make it a point to be educated in a well-rounded way. This includes a review of light physics, being able to debate the merits of Dora vs. Blues Clues, and tonight it took me on a search of moeritherium. Here's a picture. I can understand his point, and will try not to be so EVIL next time.